All our oils are fresh and bottled daily. Expiration date is at least 12 month from sale date. 100% PURE UNCUT ORGANIC LEMONGRASS ESSENTIAL OIL AROMATHERAPY. CHOOSE THE SIZE OF YOUR BOTTLE FROM DROP DOWN MENU. THIS OIL SUITABLE FOR COSMETIC PURPOSE. SHIPS IN A FOOD GRADE GLASS BOTTLES (0.6 OZ-1.1 OZ) AND PLASTIC BOTTLES (2.2 OZ - GALLON) BPA FREE PRODUCT IDENTIFICATION: Product Name: Lemongrass Essential Oil Botanical Name: Cymbopogon flexuosus Synonyms: Cymbopogon flexuosus D. Cymbopogon schoenanthus INCI Name: Cymbopogon schoenanthus oil CAS #: 8007-02-1 Country of Origin: India. Lemongrass oil has great benefits as a muscle and skin toner, and revitalizes the body and mind, helps with infections and keeps the family pet flea and tick free and smelling nice. In vapor therapy, Lemongrass oil can be used for nervousness and as an insect repellant. It is also great to revive the mind when feeling lethargic and to energize as well as relieving fatigue. Blended massage oil or in the bath. Lemongrass oil can be used in blended massage oil or diluted in the bath to assist with cellulite, digestive problems, as a diuretic, for infections, nervousness, for over exerted ligaments and as a general tonic. When used in a lotion or a cream, it has value in clearing cellulite, as well as toning the skin, opening blocked pores and helping with acne. The antiseptic properties are useful in treating athlete's foot and other fungal infections. Although some people may have an allergic reaction to lemongrass oil, most people do not show an allergy when it is used in concentrations lower than 3%. Since our oil only contains trace amounts of citral whereas West and East Indian lemongrass Andropogon flexuosus and A. Citratus contains nearly 79% the possibility of irritation or allergy is less. CLASSIFICATION: Contents: Mainly consists of citral (neral and geranial)with the following terpenoids of nerol, limonene, linalool and -caryphyllene PHYSICAL AND CHEMICAL PROPERTIES: Appearance: Pale yellow to radish brown liquid. Odor: Very strong and stimulating characteristic lemon odor. Solubility: Soluble in alcohol and oils. This material presents no significant reactivity hazard. Conditions to Avoid: Avoid sparks, flame and excessive heat. Materials to Avoid: Strong oxidizing agents. Hazardous Polymerization: Will not occur. Hazardous Combustion or None known. Decomposition Products: When heated to decomposition produces acid fumes and carbon monoxide smoke. Look forward to do business with you. I have other oils and butters too - CHECK OUT. The item "Lemongrass Essential Oil 100 % Pure Uncut Grade Sizes from 0.6 oz to Gallon" is in sale since Saturday, September 28, 2013. 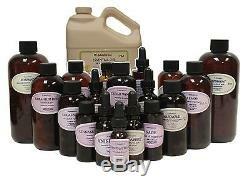 This item is in the category "Health & Beauty\Natural & Alternative Remedies\Aromatherapy". The seller is "creamselling" and is located in Chicago, Illinois. This item can be shipped to United States.